First came Codenames and then Codenames Pictures, both a team word game. Now the popular Codenames comes in a 2-player version, Codenames Duet. In Codenames Duet your joint objective is to identify 15 agents while avoiding the assassin. Of the 25 word cards arranged in a 5x5 grid in the center of the table, you will have a key that identifies about 7-8 that are your secret agents “codename”. 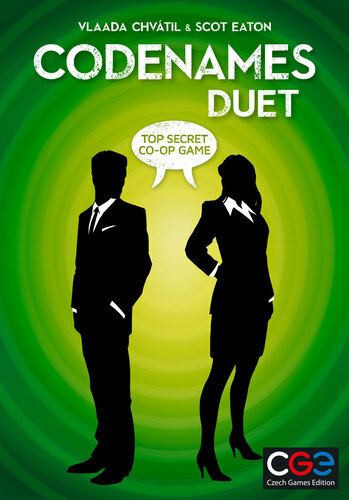 Your partner will have a key that identifies the other 7-8 words that are your secret agents codename. By giving each other one-word clues that can point to multiple words, you try to find all the agents before your turns run out. 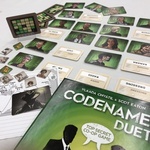 Codenames Duet comes with 100 Duet double-sided key cards and 200 double-sided word cards with all new words that are compatible with the original Codenames. After generations of turmoil, four factions have finally put their differences aside to work together for a better tomorrow. As a commitment to their newfound alliance the worlds's first airborne city, Skyward, is to be built right above the intersecting borders of the four realms. Skyward is a competitive card drafting game for 2 to 4 players. Each round buildings and resources are provided for the city of Skyward and a Warden is appointed. As the Warden, you take the control of how resources are split into piles, but lose the ability to choose the pile you split. Each round starts with a Split followed by individual player turns. 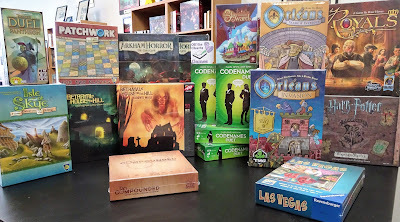 The object of the game is to develop your realm's airspace with the most valuable buildings. 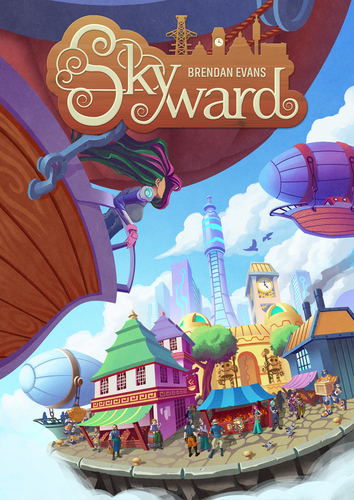 We have an open copy of Skyward available for you to come in and play.